Uni-Suit™ (short) Complete includes IRONWEAR’s™ Uni-Suit™ (short) and Hand Irons™ (HI030) 3 pounds per hand (6 pound pair) and a pair of champion Shoe Irons™(SI1.5/3A) ½ to 3 pounds each (1 to 6 pound pair). Uni-Suit™ (short) Complete sleek patented compact design is the world’s best and most popular weighted suit. Uni-Suit™ from IRONWEAR ™ is the only weighted line to be endorsed by Reebok™and is used by more athletes and trainers around the world than any other weighted suit. Uni-Suit™ (short) Complete as supplied is adjustable from 1 to 29 pounds, and includes 42 individual ½ pound patented soft Flex-Metal™ weights. The Uni-Vest™ and Uni-Pants™ each have 18 unique stretch pockets which can hold one or two weights securely on all sides The Shoe Irons™ has 3 weight pockets on each foot. With one weight in each pocket the Uni-Vest™ and Uni-Pants™ each weigh approximately 10 pounds and with two weights in each pocket they each weigh approximately 20 pounds. With one weight in each pocket the Shoe Irons™ each weigh 1.5 pounds and with two weights in each pocket they each weigh 3 pounds each. In addition the complete system includes 3 pound each, 6 pound Hand Irons. Uni-Suit™ (short) Complete gives you the ability to move weights back and forth between the Uni-Vest™, Uni-Pants™ and Shoe Irons™. 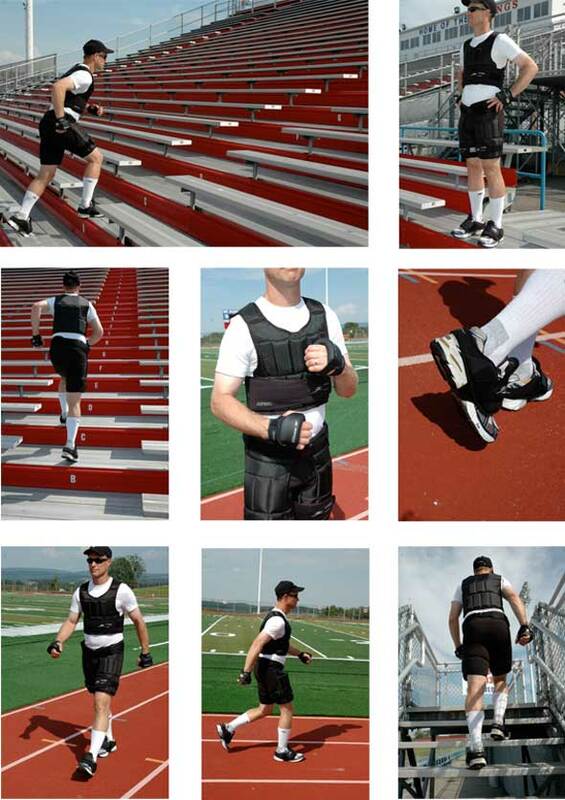 For example you can take 36 weights and load them into the Uni-Vest™ or Uni-Pants™ to take either to 20 pounds. Uni-Suit™ (short) Complete is adjustable to 52 pounds with the purchase of additional weights and adjustable up to 74 pounds with the purchase of a short Under Vest™. No other suit gives you the expandability of the Uni-Suit™ (short) Complete. Uni-Suit™ (short) Complete is designed to uniformly distribute the weight over the body and the patented soft Flex-Metal™ weights bend and flex with your every movement. The thin design can be worn comfortably on top or under your clothing or sweats. Uni-Suit™ (short) Complete has a wide shoulder and belt design with extra padding for added comfort and support for heavy loading. The soft Flex-Metal™ weights conform to your shape and become one with your body. This allows the suit to fit better with more comfort that any other suit. Uni-Suit™ (short) Complete is in a league of it’s own. 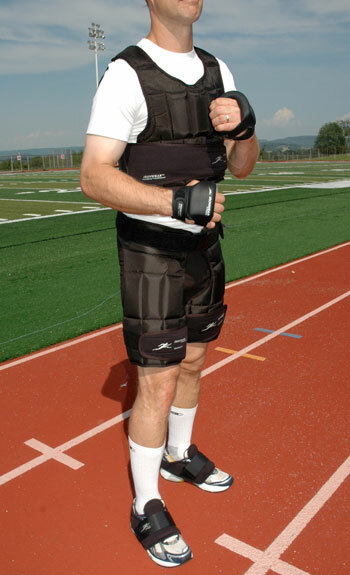 The proprietary oversized overlapping elastic strapping system holds the suit securely to almost any size torso while allowing for expansion and contraction of the chest during heavy breathing and to almost any size legs while providing for the expansion and contraction of the thigh muscles during rigorous exercise. Uni-Suit™ (short) Complete fits securely on a wide range of body shapes and sizes from individuals weighing from under 100 to over 350 pounds. Uni-Suit™ (short) Complete open mid section design provides unhindered torso rotation and bending potential. The design also helps keep you cooler and is great for push-ups, sit-ups and other floor work. Uni-Suit™(short) Complete has a heavy padded ballistic Nylon shell for maximum durability and soft inner fabric system designed for comfort and the wicking of sweat. The edges and seams are all fabric covered for comfort and double stitched for added strength. Uni-Suit™(short) Complete is easy to maintain and can be washed by hand with the weights in or machine washed with the Velcro attached and the weights removed. 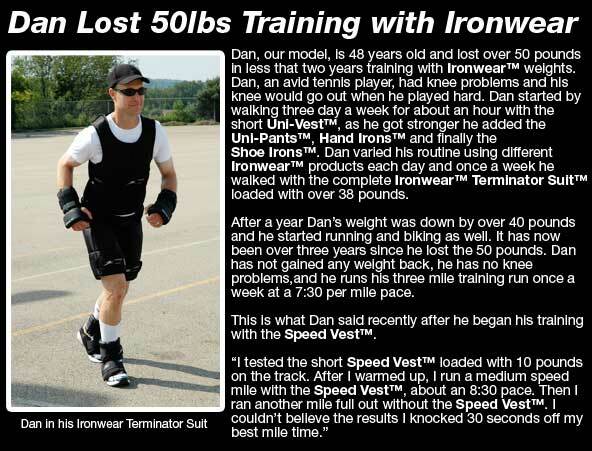 Uni-Suit™ (short) Complete includes the Uni-Vest™ (short) IRONWEAR’s™ most popular weighted exercise vest. This vest has a large head opening and wide flexible padded shoulder straps for maximum support and mobility. The Uni-Vest™ (short) adjusts quickly and easily while in place to accommodate chest sizes below 26 to over 54 inches. The Uni-Vest™ (short) short design works well for almost any person from below 5 to over 7 feet tall. The Uni-Vest™ (short) can be loaded up to 20 pounds by itself or it can be expanded up to 44 pounds with the purchase of an Under Vest™ which lock to the inside of the Uni-Vest™ (short) and adds additional pockets for more weight inserts. Uni-Suit™ (short) Complete includes the Uni-Pants™ IRONWEAR’s™ revolutionary weighted chaps which fit easily and quickly over any type of pants. Uni-Pants™ patented belt system adjusts in the back to accommodate waist sizes from under 24 to over 54 inches. While the oversized thigh straps hold the weights securely on thighs from less than 16 to over 30 inches in circumference. Uni-Pants™ open design helps to keep you cool and allows for uninhibited movement of the legs. Uni-Pants™ have 9 pockets on each thigh which can be loaded with one or two weights for a maximum of 20 pounds. Suspenders and other accessories for resistance training are also available for the Uni-Pants™. Uni-Suit™ (short) Complete includes the 3 pound Hand Irons™ IRONWEAR’s™ revolutionary hand weights which comfortably wrap around the hand into the palm. The Hand Irons™ have three adjustment straps and easily adjust to fit almost any hand size. The Hand Irons™ stay in place without being held and are great for walking, and boxing exercises. The champion Hand Irons™ are cover with a woven nylon fabric-laminate which is soft, easy to clean, and durable. Uni-Suit™ (short) Complete includes the Shoe Irons™ IRONWEAR’s™ revolutionary weighted spats which fit easily and quickly over any type of athletic shoes. Shoe Irons™ patented system has a rubber strap that goes under the instep of the sole and an additional strap that stretches around the heel. The arch strap tightens around the shoe to hold the weights in securely in place. Shoe Irons™ adjust easily to fit most shoes from a women’s size 7 to a men’s size 15. Each Shoe Iron™ has 3 stretch weight pockets that can hold up to two weights each. The design is much better than ankle weights and does not inhibit the natural movement of the foot. Shoe Irons™ are also great because the your Shoe Irons™ contact the ground with the foot so the is no jarring or sliding as occurs with ankle weights. 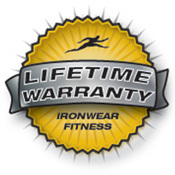 Uni-Suit™ (short) Complete’s Flex-Metal™ weights are covered by our factory lifetime warranty. Unlike other suits, which use cheap weights, our weights are the most expensive part of the suit and are very durable. Uni-Suit™ (short) Complete’s shells are the most durable in the industry and are also covered by our factory lifetime warranty. In the unlikely case that you wear out or damage your shell, we sell shells for about half the replacement price of a new suit.